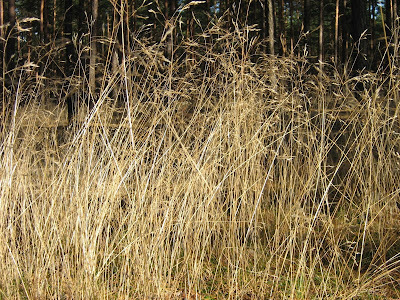 Wavy hair-grass Deschampsia flexuosa, photographed by Botaurus. Deschampsia is a genus of grasses found in cold and temperate regions of the world. Characters (from Cheeseman 1906): Perennial grasses. Leaves narrow, flat or convolute. Spikelets rather small, 2-flowered, arranged in lax or contracted panicles; rhachilla disarticulating above the 2 outer glumes, produced between the flowering glumes and above the upper flower as a naked or hairy bristle, rarely ending in an imperfect flower. Glumes 4; 2 outer slightly unequal, persistent, empty, keeled, acute, membranous, shining ; 3rd and 4th (or flowering glumes) membranous or almost hyaline, toothed at the apex ; dorsal awn slender, twisted at the base, sometimes very small or wanting. Palea narrow, 2-nerved. Lodicules 2, ovate. Stamens 3. Styles distinct; stigmas plumose. Grain oblong, enclosed within the unaltered flowering glume and palea. [S03] Singh, J. N. 2003. Grasses and their hydro-edaphic characteristics in the grassland habitat of Nilgiris Biosphere Reserve, Tamil Nadu. Bulletin of the Botanical Survey of India 45 (1–4): 143–164.